I think Tottenham has what it takes to even push so far as second place and give Manchester City a run. If they are able to keep their players and add a few more in the offseason, they could even end up with a squad capable of challenging for next season’s Premier League title. Here are my 5 reasons why Tottenham Hotspur will finish in third this season. Tottenham has been in a similar situation for the past 4 years. They have players in the squad that experienced last season’s meltdown and this will go a long way in helping them to stay in the race instead of dropping off. In the past 3 season’s they have finished in fourth (2009/10 with 70 points), fifth (2010/11 with 62 points), and fourth (2011/12 with 69 points). After 28 games in those seasons Spurs were placed fourth in 2009/10 with 52 points, fifth in 2010/11 with 48 points, and third last season with 53 points. There has certainly been some consistency, but also with the trend of moving up the table. Where they sit now, in third place on 54 points, is the best point tally yet of the past four seasons through 28 games. They have the potential to finish third and possibly even second if they are able to keep going. The players in the current squad are a good mix of experience Premier League veterans and youthful exuberance. The team that has been assembled is one that has finally been able to correct mistakes made through the season and continually string results together. They have shown that they can learn from errors (manager included) and do what needs to be done to adapt and move on. Last season Harry Redknapp had Tottenham in nearly an identical position. The problem came when the English media began throwing around the idea of him becoming the next England manager. This seemed to really turn his head despite his constant claims that he wouldn’t discuss it till after the season. This year they have had the consistency of Andre Villas Boas. Fans may not have liked his appointment, but since the results began to flood in the fans have come around. 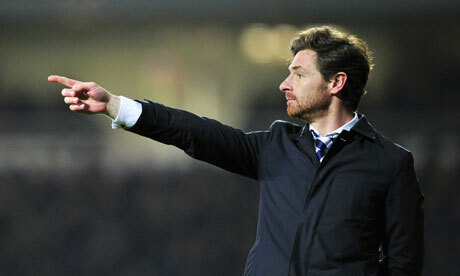 Villas Boas has done an excellent job of getting these players to play for him and to buy into his ideas. He has also done a great job of setting up a team that plays to its strengths, mainly, its speed. He has done well with implementing a highly intense pressing style of football. This year he seems to have gotten the players willing (and able) to play a high line and press the opposition throughout the pitch. Couple that with their ability to send a fast paced counter attack to other way and they have a formidable team. At the start of the season it looked like they were going to be doomed by last minute opposition goals, but they have managed to cut this out and move on. This has even included the ability to get their own last minute winners. This includes their last gasp goal against EPL leaders Manchester United to earn a draw, which also made them the only team this season to get points off of United in both league fixtures (a win and a draw). Tottenham Hotspur is finally building a Premier League club that could be capable of challenging for titles. They have brought in some real top notch talent while also developing some great players from within. While Clint Dempsey has been a rather disappointing purchase Mousa Dembele has settled in to take control in the center of the pitch. Lewis Holtby was an excellent January transfer who has also done an excellent job controlling the midfield when he is brought on. However, the areas that have truly shined this year have been at the ends of the pitch. On offense they have (when fit) an extremely pacey front line of Jermain Defoe, Aaron Lennon and Gareth Bale. Bale has single handedly changed the shape of many games throughout this season and is a deserving nominee for Premier League Player of the Year. Their defense has been a major reason they are still contending for a top 3 finish. Players like Jan Vertonghen, Kyle Walker and Sandro along with Michael Dawson and Steven Caulker, have really done well to strengthen the back line. Perhaps the biggest factor has been the addition of Hugo Lloris in goal. His ability to get off his line quick and act as a sweeper when necessary as well as his goal stopping abilities have been a massive addition for them. Tottenham’s opposition at the top include Manchester City, Chelsea, and Arsenal and all three of them have had dips in form and inconsistencies throughout their seasons. This has left the door wide open for Tottenham to claim a spot at the top, even as high as second. Last weekend Tottenham pulled off a North London Derby win over Arsenal which proved to be a huge result that puts them 7 points clear. Thanks to unconvincing form by Manchester City and Chelsea this season Tottenham are also 2 points ahead of Chelsea and 5 behind City. It will work out even better for them if they can also get wins against both of these clubs. Tottenham is really picking up the results lately and their form has been unbelievable in all competitions. They are hitting stride at just the right time, while their nearest opponents have remained unconvincing. Spurs this season has managed to do what they could not do in previous seasons, continue to get the results they need. They do not have an easy set of fixtures leading to the end of the season, but they definitely have a shot at winning most of them and dropping few points. They have already gotten some great wins such as their home win against Arsenal. This also includes their last gasp goal against EPL leaders Manchester United to earn a draw, which also made them the only team this season to get points off of United in both league fixtures (a win and a draw). Looking at their fixtures list they have some rather difficult matches coming up starting with going to Anfield to face Liverpool. They also still have Swansea and Chelsea away as well as Everton and Manchester City at home. It could become a very interesting race for them. I still think that Tottenham Hotspur have an excellent chance of ending up in third place at the end of the Premier League season. There is certainly the outside shot of a second place finish as well, but this will definitely be a difficult undertaking that will require no errors, a bit of luck and some slip ups by teams around them. What do you think? Do they have what it takes? Maybe their run in the Europa League will tire them out, or could it galvanise them?